So you have discovered the beauty of Kauai and have decided to buy your home-away-from-home! Perhaps you intend to offer your new property as a vacation rental to offset some of the costs of ownership? Kauai is a highly desirable vacation destination with consistent “beach” weather all year long! Visitors embrace the myriad of ocean activities available along with air and land aventures, beautiful hikes, world-class golf courses, food and farm tours and nature exploration. Restaurants serving fresh local produce, an abundance of farmers markets and creative artisans offering Kauai-made products all help to create a thriving tourism market. Friendly residents, coupled with a genuine spirit of Aloha, makes Kauai the perfect island community for your new investment. This guide will provide you with the knowledge needed to rent your vacation home on Kauai. We wish you great success with your new venture and many amazing and memorable experiences for your future guests! Need help planning your vacation? Give us a call at (808) 742-9202 or use our instant Live Chat feature at the bottom right of your screen. 1, 2, 3 and 4 Bedroom Condos located on Kauais South Shore. All condos are within walking distance to the ocean and close to shopping and restaurants. Need help planning your vacation? Give us a call at (808) 742-9202 or use our instant Live Chat feature at the bottom right of your screen. Private homes located on Kauais South Shore. Need help planning your vacation? Give us a call at (808) 742-9202 or use our instant Live Chat feature at the bottom right of your screen. 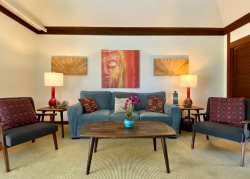 1, 2 & 3 bedroom condos located on Kauais North Shore. Need help planning your vacation? Give us a call at (808) 742-9202 or use our instant Live Chat feature at the bottom right of your screen. Private homes with pools located on Kauais South Shore. Need help planning your vacation? Give us a call at (808) 742-9202 or use our instant Live Chat feature at the bottom right of your screen. Large private homes or condos. If you would like to rent multiple properties within close proximity to each other give us a call at (808) 742-9202 or use our instant Live Chat feature at the bottom right of your screen. Oceanfront condos and homes. True oceanfront, no buildings, roads or obstructions between you and the ocean! Need help planning your vacation? Give us a call at (808) 742-9202 or use our instant Live Chat feature at the bottom right of your screen.